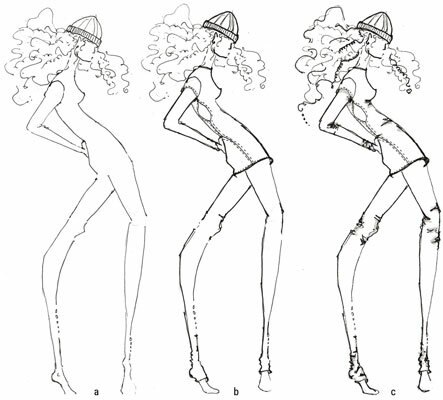 Draw a long, lean fashion figure and show her (or him) off in clothes that really hug that bod. Some clothes are really tight, and why not? On the body of a fashion figure, that’s often the way they look best! No matter how tight the shirt, dress, or pants are, folds do exist — tinier ones. You need to add them to show how even the tightest of fabrics stretch. You’re your own best model for figuring out where folds should fall in your sketches. Put on a tight pair of jeans or leggings and stand in front of a mirror with one hand on your hip. Where do you see folds? You typically see them where the body bends. Notice that the tighter the area of bending, the smaller the folds are. Your body is three-dimensional and full of curves and angles, so when clothing is tight, you’ll always have areas with folds. Now try the same pose while wearing loose jeans or pants. Again, notice where the fabric folds and how large those folds are. When clothing is looser, the fabric folds in places where the body bends and where gravity pulls the fabric down. Even the tightest articles of clothing have folds at the elbows, hips, crotch, ankles, and knees in a fashion drawing. Draw a female fashion figure. Map out a tight little dress and leggings on her body. Draw a few small lines to show folds at the elbows, knees, stomach, and ankles. Add one or two diagonal folds under the breasts and use shading to add depth to the folds.